There are many factors that can comprise the national interest. Fuel security should be at the top of the list. One-third of the Royal Australian Navy’s surface combatant force is committed to the wrong part of the world, at least according to James Goldrick and Andrew Shearer in an opinion piece in The Australian on Thursday. They argue there is a shift in the balance of power in the Asia Pacific (for which, read an increasingly confident and capable Chinese navy), and that Australia can ‘can no longer take a free and open region for granted’. As a result, the authors contend that the Australian Defence Force cannot justify providing a frigate for continuous operations in the Middle East at the expense of a greater presence closer to home. 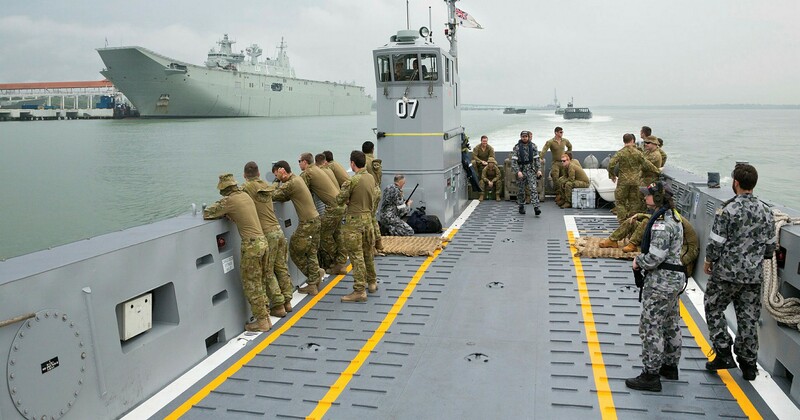 They suggest that shifting Royal Australian Naval priorities to the Asia Pacific would enable Australia to continue to help the US maintain the ‘rules based order’ and protect Australia’s national interests. The term ‘national interests’ is beloved of strategists and policy makers alike. It is also near impossible to define. Nowhere is this more apparent than in the world of defence. The latest Defence White Paper uses the term 12 times. Yet not once does the White Paper define in detail what those national interests are; the phrase is allowed to represent whatever the government of the day decides. While politically expedient, this is hardly a solid base for strategic planning. Nor is it a sound foundation on which to argue shifting the focus of naval operations. In an attempt to put some hard facts behind the term, it's useful to examine one facet of national interest to examine whether there is indeed a case to shift maritime operations from the Middle East to the Pacific: fuel security. Are Australia's naval assets best placed to support this aspect of national interest? Given the Middle East has traditionally been considered critical to Australia’s fuel security, it's a question well worth asking. The importance of fuel security was vividly demonstrated during the fuel duty protests in the UK in 2000. Although protesters targeted the distribution network rather than imports, analysis of the resulting chaos shows that within days the protests had ‘paralysed critical infrastructure sectors and brought the country to a virtual halt’, partly because the UK was working on a ‘just-in-time’ policy for fuel distribution. The financial impact of just one week’s disruption was estimated at approximately £1 billion. Despite the growth in renewable energy, almost every aspect of the Australian economy is dependent on petroleum imports. We import not only automotive gasoline for cars and liquid petroleum gas, but also aviation turbine fuel, diesel oil, lubricants and greases, and even bitumen. Indeed, fuel security is considered so important to the modern state that the International Energy Agency (IEA) requires its 30 member states - including Australia - to maintain 90 days worth of net imports (calculated as 90 days of the average daily net imports over the previous calendar year) as a reserve. In the case of a disruption to supply, this would allow the country to continue functioning, at least for a while. The IEA publishes monthly updates of member states’ net import holdings. These are broken down into the amount covered by industry stocks within the member state, and those held by government-owned stocks (and stockholding organisation stocks) for emergency purposes. Of all the member states in the IEA, Australia holds the lowest amount of oil stocks. In June 2017, this totalled just 49 days worth of net imports, all held by industry. This is well short of the 90 days Australia is mandated to hold, a target Australia has not met since March 2012. Dig a little deeper and the stocks diminish even further. Every month the Australian Department of the Environment and Energy publishes a report titled Australian Petroleum Statistics, which lists both the current fuel stocks on hand and how much is available at current consumption rates. In July 2017’s report, while Australia had 45.9 days of fuel at net import rates, this only equated to 22 days worth of fuel at current consumption rates. In effect, Australia has a national ‘just-in-time’ approach to fuel, which is especially vulnerable to disruption. Plans by the government to address this have been announced, but even these do not envisage Australia being IEA compliant until 2026. With such a shortfall in fuel reserves, the RAN's role in protecting the maritime trade routes along which Australia imports fuel is critical. So with that in mind, surely the Middle East is a sensible place for the Navy to concentrate its operations? Actually, no. The Australian Petroleum Statistics report also outlines the origin of Australia’s petroleum imports. Of the $26.7 billion worth of petroleum products imported over the last financial year, only around $2 billion worth was sourced from the Middle East, North Africa and Europe (ie. from origins that would transit the Gulf of Aden and the Suez Canal, where the current RAN deployment helps provide security). Even if you include imports from Russia, some of which may originate in Europe and transit the Suez Canal, it is still only $2.25 billion. In contrast, $23.06 billion worth – some 86% - of petroleum products originate from the Indo-Pacific, an area of increasing maritime instability. There are many, perhaps infinite, factors that can comprise national interest. However, not all are equal and not all can - or should - dictate defence policy or operational priorities. Fuel security is only one measure of national interest but is arguably more important to Australia’s national security than, say, disrupting the Middle East narcotics trade. A redeployment to the Indo-Pacific would also better support the continuing US pivot to the region, and help to neuter any concerns about damaging the US alliance. Crunching these numbers suggests the recommendation made by Goldrick and Shearer deserves consideration. Certainly the facts about our fuel imports demonstrate the strategic importance of the Indo-Pacific region.